Stefan Molyneux on last night's testimony (by a Blasey Ford ex-boyfriend) that Blasey Ford perjured herself in her anti-Kavanaugh testimony last week. We've been exploring the possibility that transiting Pallas against a natal chart can correspond with events in which "the truth comes out". Here in the backdrop of (prospective justice Kavanaugh's sexual assault accuser) Christine Blasey Ford's discrediting, we have transiting Pallas (truth?) 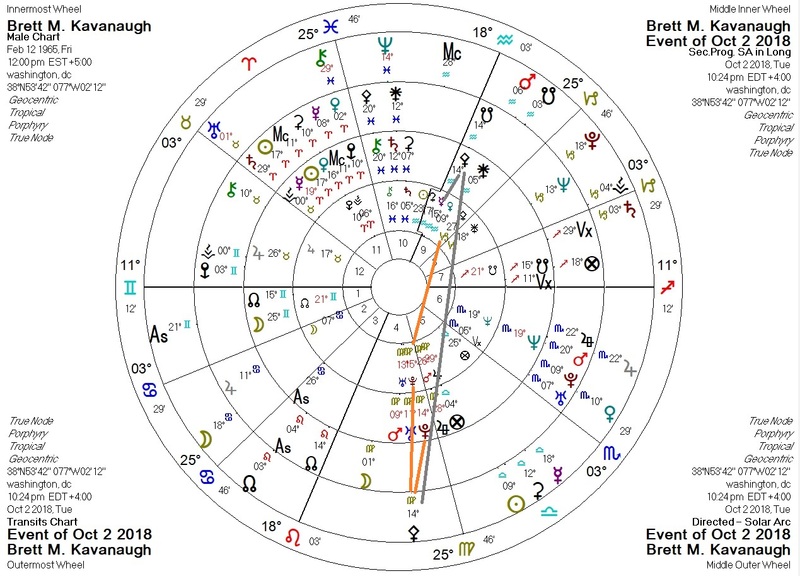 conjunct Kavanaugh's Pluto (destruction/betrayal? ), sesquiquadrate his Pallas, and quincunx his Mercury (speech/accusations?) and progressed Pallas. If this type of pattern proves to be consistent, it will be a big deal. At least to me. The mainstream media will avoid reporting on this testimony as long as they can. P.S. All we know about Blasey Ford's nativity is that she was born in November 1966. That entire month, Mars, ruler of Pallas in Aries, was conjunct Pluto. And if you're not new here, it should be clear that Pallas-Pluto involvement significantly reduces one's chances of being a moral saint.